AquaSurTech OEM products can be sprayed with any common spray technology (Conventional Spray, Airless, HVLP), or brushed on. The main factor which will vary between these methods is the optimum viscosity of the coating. In general, a good surface finish is the objective. HVLP is AquaSurTech OEM's recommendation. HVLP stands for High-Volume, Low-Pressure. Conventional high-pressure guns and sprayers blast the coating on to the surface at such high pressure that the coating gets over-atomized and literally bounces back from the surface, producing large amounts of waste, commonly called overspray. HVLP, on the other hand, is the use of High Volume, Low Pressure air for the purpose of spraying any liquid, sprayable coating. By spraying at low pressure, the coating is never over-atomized and does not bounce back from the surface. By eliminating bounce-back and over-atomization, HVLP guns and sprayers can virtually eliminate overspray. The end results are substantial savings in material and operating costs, a cleaner, safer working environment, and a superior quality finish! 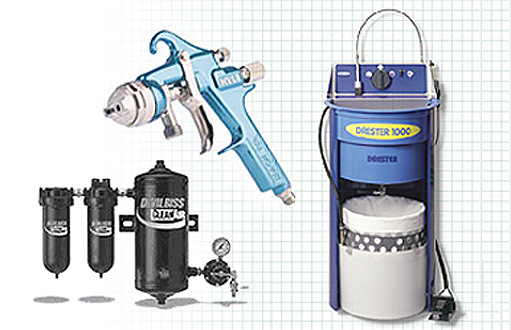 In addition to the spray technology itself, a compressor capable of providing the necessary air volume is required. Filtration (moisture and oil removal) is also critical to obtaining good finishes. Independent of which HVLP supplier is selected, every gun design has a recommended nozzle size, depending on the viscosity of the product being sprayed. We recommend relatively large nozzles (typically around 1.8 mm -2.0 mm). Painters accustomed to using solvent based coatings will be used to smaller nozzles. The tip size is very important since proper atomization (and the resulting quality finish) requires a correctly sized nozzle. For any volume production, a remote pot style system will provide maximum flexibility in maneuvering the gun, and produce the least amount of fatigue for the painter. The downside for this style of system is that it takes longer to clean than a gravity feed unit.